Pope Francis met with missionaries from Africa on Friday, and offered a vision for how to bear witness to the Gospel. Proclaiming the Gospel is not the same thing as proselytism and often means simply being a neighbor and friend to someone while living an authentically Christian life, Pope Francis said. Mission “is that dynamic that leads you to be a neighbor to others to share the gift you have received: the encounter of love that changed your life and led you to consecrate your life to the Lord Jesus, good news for the life and salvation of the world,” the pope said on 8 February. Pope Francis spoke about mission and witness during a meeting with the Missionaries of Africa and the Missionaries of Our Lady of Africa, men’s and women’s religious orders founded 150 years ago by Cardinal Charles Lavigerie of Algiers, Algeria. To be a missionary, the pope said, a Christian first must be a disciple of Jesus. The missionaries’ dialogue with Muslims deserves particular recognition and the gratitude of the church, the pope said. Our own Msgr. 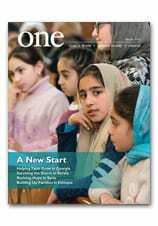 John E. Kozar expressed his thoughts about “accompanying our brothers and sisters” in the current edition of ONE. Check it out.